Nice ride! You my friend have excellent taste in color. This car looks like a great starting point for a weekend cruiser or collector vehicle. Last edited by siavash82ir; Wed, Jan-30-2019 at 02:42:36 PM. 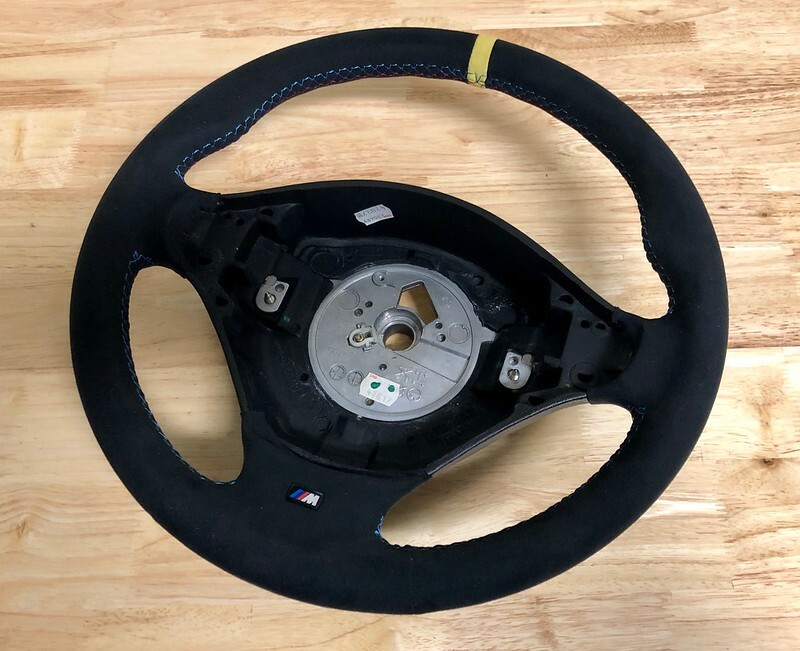 I have replaced worn steering wheel on my M Coupe last week, and these wheels are identical to the M3 wheels. 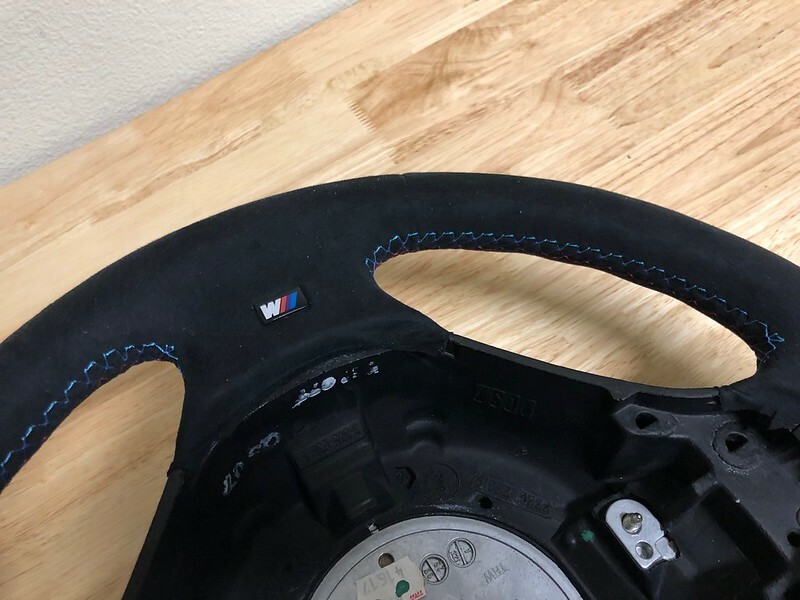 Since I have no use for this worn wheel, I thought about re-wrapping it in black alcantara (love my E46 ZCP alcantara wheel) and swapping it in my Dakar (will keep the original M3 wheel intact, its still in great shape). 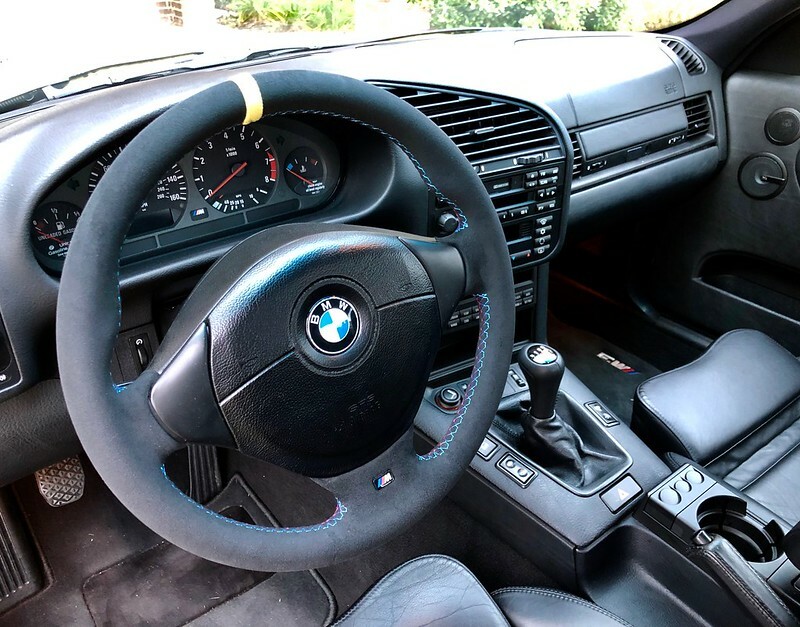 SO, anyone have any pictures how the stock wheel re-finished in black alcantara look in the cockpit? Trying to get the feel for the look. Well, since no one responded, I decided I'll be a guinea pig. Sent my old wheel to be re-wrapped to Coby wheel, and it came back couple of days ago. Couple of words about Cobywheel quality of work - the wrap is very nice, if I didn't know it was re-wrapped, I'd say its a factory job. 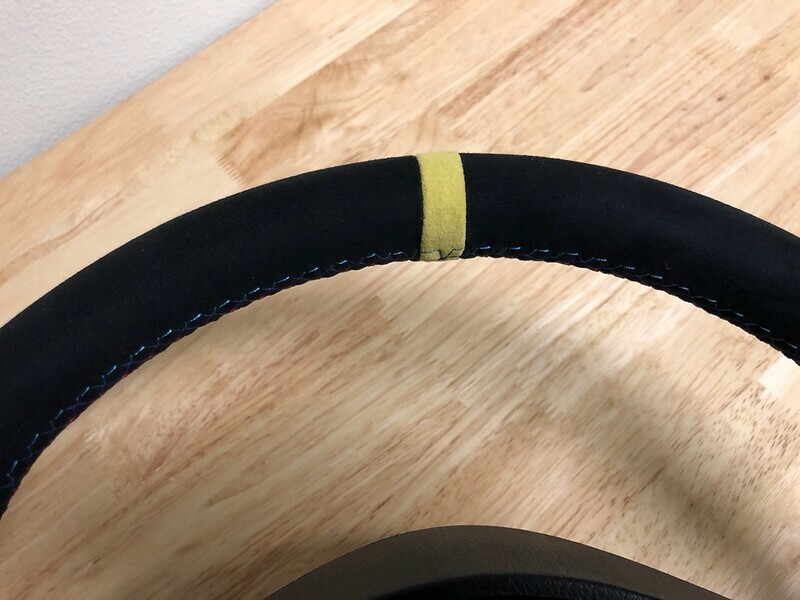 Though, on the closer inspection, couple of things stood out - the red thread is slightly different shade than OEM, and stitch itself is tiny bit bigger than stock. No big deal really, but wanted to mention. Overall, high quality work. Installed the wheel last night - and I really do like the look so far. 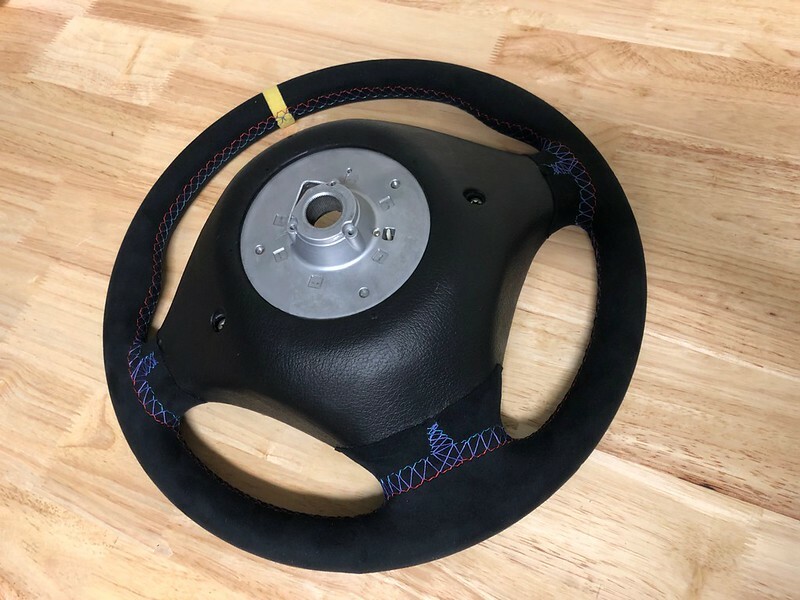 The wheels is tiny bit fatter than the original (the thickness of the alcantara material, I did not add any extra padding), and feels perfect in your hands. Since I kept the original wheel, I can always swap back, I guess. So overall, pretty happy. That does look good although I think the on-centre stripe is a matter of taste. Even though you've pointed out the stitching discrepancy I still think it looks fine. Now, how do we stop our airbags leaching that bloody plastic compound?!? Argh. Shift boot to match next? Doubt I do the shift boot, I like it in leather. Yellow stripe - it was an attempt to make the interior a bit more lively, and dakar stripe was one way to do it. If I were to do this again, I'd probably skip the stripe, though I'm ok with it for now. 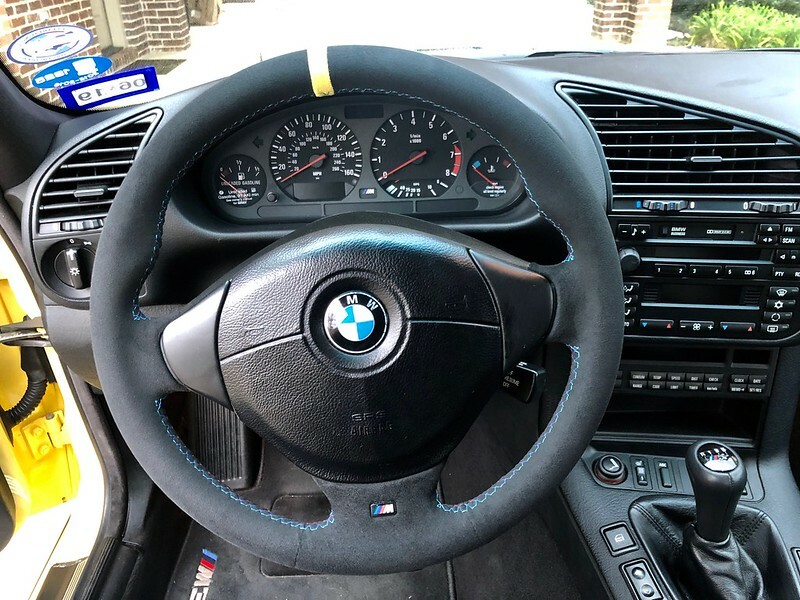 Nate, it should hold up well, I have alcantara wheel on my E46 ZCP and it is still looking very decent after 110K miles. Might loose some of its black color, though. Well, yes plus the car is a weekender at best, so don't expect a lot of wear overall. Should last a long time. 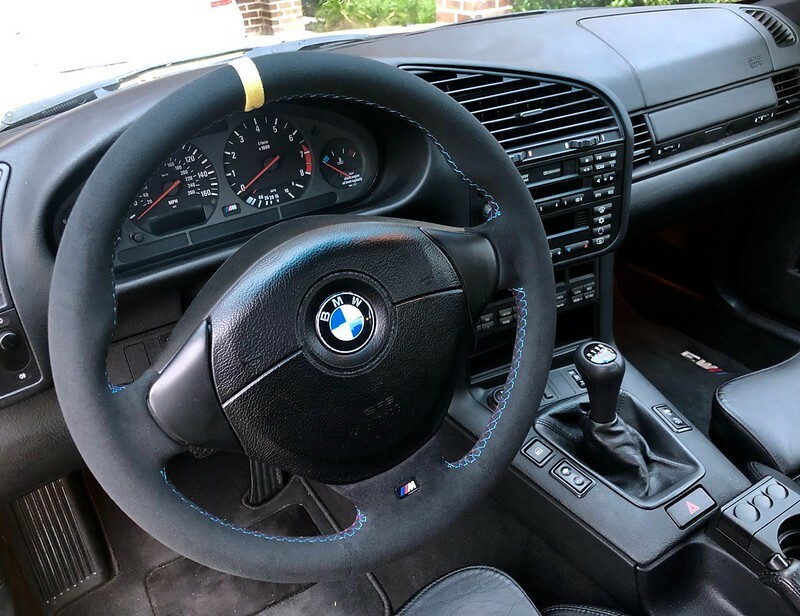 I've contemplated which color alcantara to go with on my E46. Your first few photos look very black but the in-car photos look just right (more graphite). I think gray alcantara may be TOO gray. All times are GMT. The time now is 10:49:46 PM.